As the rebooted Apes saga marches ever closer to the Planet discovered by Charlton Heston all the way back in 1968, it becomes ever more prudent to choose a side in the upcoming simian war. That’s why we’re giving our fellow Chicagoans the chance to pledge their allegiance to either Andy Serkis’ mo-cap ape Caesar or Woody Harrelson’s regular old human Colonel before the movie opens nationwide. 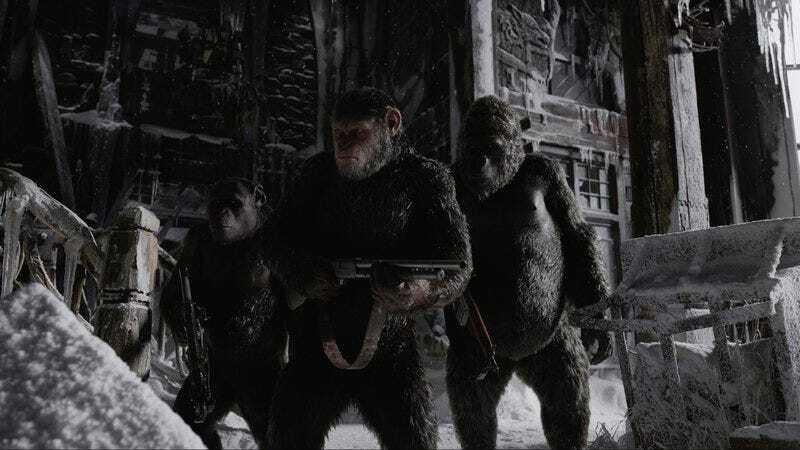 We’re giving away 30 pairs of tickets to an advance screening of War For The Planet Of The Apes on Tuesday, July 11 at 7:30 p.m. at the Kerasotes Showplace ICON on Roosevelt. To enter, just follow this link and fill out a few basic details—name, email address, blood type, that sort of thing—to register for your tickets. But remember, advance screenings are often intentionally overbooked, so be sure to arrive early if you want to secure a seat. The War For The Planet Of The Apes begins on July 14.